1. Thumbs up for good cutting! Teach your child that “thumbs up” means “good job”. Then, show them that in order to cut properly, both hands should be “thumbs up” or “thumbs on top”. Most parents don’t realize that their child is”thumbs down” on the hand that holds the paper. In order to have the best control, both thumbs should be facing up. Many children use their whole arm when they only need their hands. This is a sign that they are still developing shoulder stability. You’ll notice that they may stick their elbow out, instead of keeping it stable by their body. This is a sign that they are compensating for weak upper body strength and stability. You can help this along by having your child spend more time on their belly when reading or doing puzzles, etc. In the meantime when they are cutting, remind them “elbows tucked in”. This will give them better control. 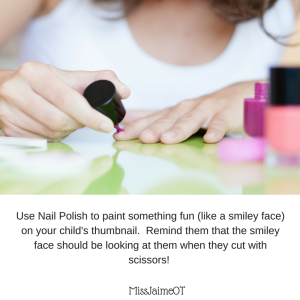 If your child consistently forgets to hold the scissors right side up with their thumb in the little hole, make it fun by drawing a face on their thumb or their thumbnail before they begin cutting. Tell them that the thumb is the bus driver. He sits in the front seat (small window) by himself. The rest of the fingers are the kids, they sit in the back together. Most kids like this trick. If they still have trouble after a few times, you can also try gluing or drawing eyes on the “little hole”. 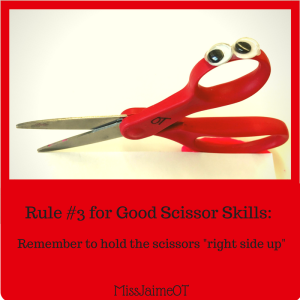 This way, when your little one picks up the scissors, the eyes are “watching him”. Hot glue does not last very long on plastic, but that’s ok! Hopefully, by the time the googly eyes fall off, your child will have developed the proper habit. 4. The writing hand is the cutting hand! Children should have developed their hand dominance by the time they are four. However, sometimes they may still switch for certain activities. 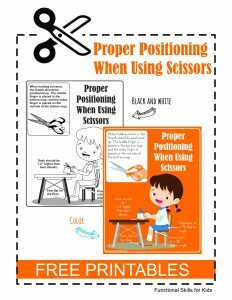 With scissors, I find that lefties often switch to “righty” to cut because the blades of typical scissors work better when cutting with the right hand. 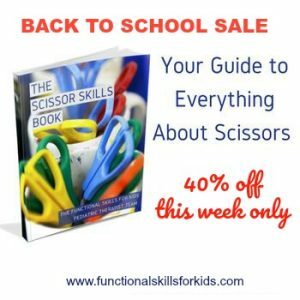 (Most lefty scissors have the blades reversed – who knew!?) Some parents buy their child a lefty scissors to make it easier. I highly suggest this! But they may still switch hands. 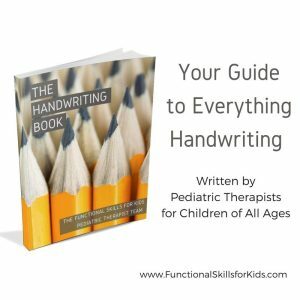 If your child is switching hands, encourage them to use their dominant hand. If you aren’t sure whether they are lefty or righty, watch which hand they use to pick up their fork, crayon, or a toy. Place objects in the middle of their body and see which hand they prefer. 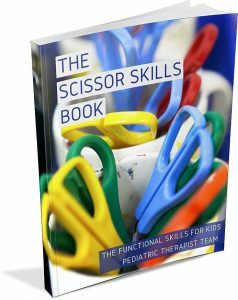 Once your child has chosen a hand, encourage that hand for cutting, coloring, and using a fork. 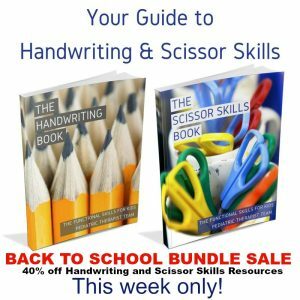 One tip to help them remember is to use a tattoo! Put a removable tattoo on your child’s dominant hand as a “reminder”. Kids love tattoos and it’s an easy fix. 5. Get those muscles strong! 1) Fill an empty spray bottle with water and let your children spray the plants, the car, the chalk off the driveway! 2) Bring it to the beach or the pool and let your children spray you, themselves, or each other when they get hot! 3) Same goes for old fashioned (trigger style) water guns. 4) Use your old tweezers to pick up beans, beads, or anything small. 5) Use Spaghetti Tongs to pick up all the dirty laundry (or anything else) off the floor. 5) Use an old sock to make a sock puppet – draw a mouth and a face so your child practices “opening and shutting” the mouth as he talks. On sale Monday to Friday! 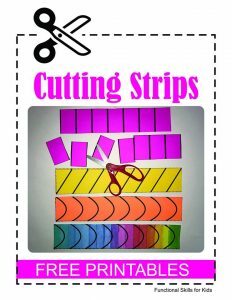 Hope these simple tricks help you to help your child with the tough task of learning how to cut! Good Luck! GREAT JOB Miss. Jaime!!! 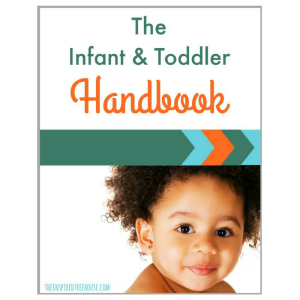 These are wonderful suggestions for parents! Pingback: Is my child Righty or Lefty? How to tell... - Miss Jaime O.T. Pingback: Seamless Clothing for Your Sensitive Kid... - Miss Jaime O.T.